Gajar ka halwa also known as gajrela or gajorer halwa, is a carrot -based sweet dessert. This dessert is made traditionally in India, mainly on the occasion of Diwali, Holi, Eid-Al-Fitr and Raksha Bandhan.It is served hot in winter. 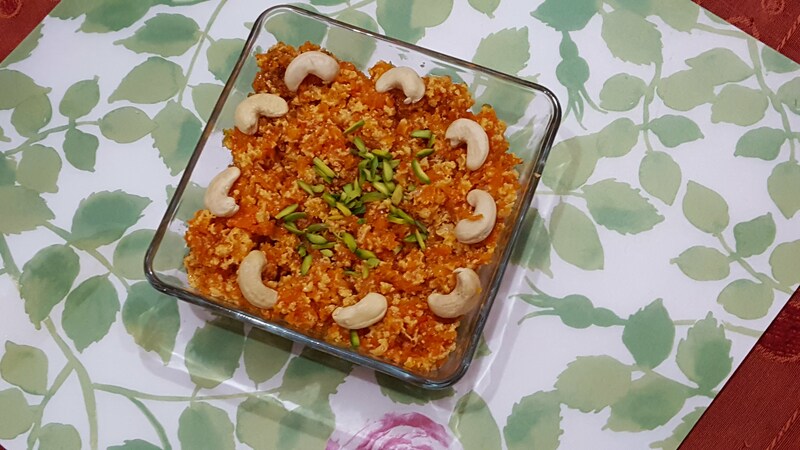 Gajar ka halwa is a very delicious and healthy sweet for parties. cook the grated carrot with milk in a pressure cooker for five minutes or give one whistle with medium flame. Take a heavy based pan heat ghee add cardamom powder and boiled carrot, sugar, stirring constantly for 8-10 minutes do not leave it alone if left alone it can stick to the bottom and burn . Add condensed milk stirring regularly, cook for 5-7 minutes add blanched almonds.Gajar ka halwa is ready.garnish with cashews and pistachios.